We were not disappointed this year either. They upped the ante by adding more breweries and more restaurants. 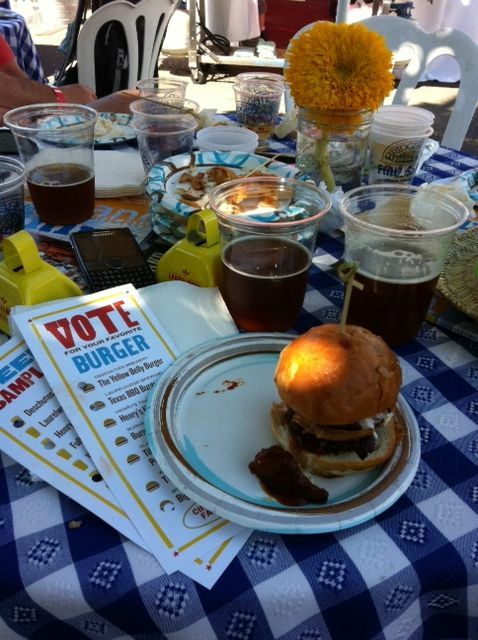 Each restaurant works extra hard to create the best burger, because we all get to vote for the best one. And trust me, they go above and beyond to make it awesome. Last year it was Laurelwood’s burger hands down. I still remember it to this day. But this year, they had some good competition. In the end we sampled (because it was a lot) 7 burgers. And yes, I did sample all 7, because I am not a quitter. There were 10 breweries there each sampling at least 2 different beers. 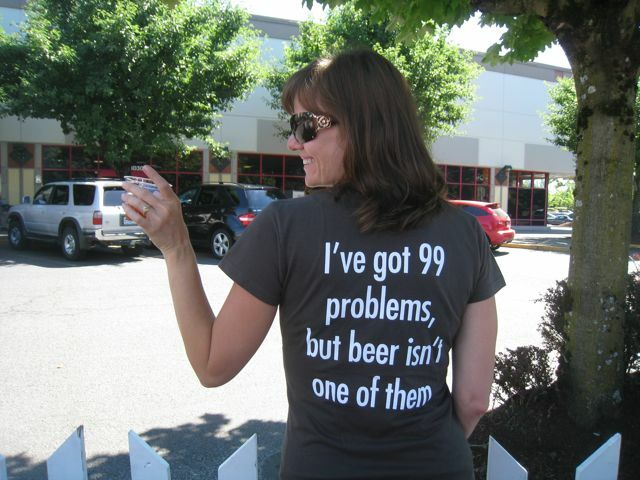 The samples were not small by any means, so the beer was a flowing. From this sampling I discovered that Henry’s has a red beer that I really like. Full Sail has a summer beer that is amazing and is only available for a few more weeks. I also learned that Rogue has some ginger and chamomile beers that were just not my thing. But I don’t care if I love them or hate them, I just love the adventure of seeing what they all have to offer. Even the guy at Ninkasi was extra helpful telling me most of those beers are probably not for me, after he evaluated my taste. Nonetheless I tried what they were sampling, and he was right, not for me. The burgers this year were very creative. I love watching them crank out beautiful burgers. We started with the Bridgeport Burger. It was the only one with a slaw, it also had a green sauce on the bun that was a perfect addition to all the toppings. Not only was it a great burger, but when you start with one that perfect, finding a better one was going to be tough. There were descriptions for all the burgers, but I didn’t have time to make notes or take pictures, my hands were full. Laurelwood had a burger with a brisket on it and a BBQ sauce. It was good and all, but I am not a huge BBQ fan. Everyone at my table disagreed with me, they said it was awesome. Deschutes Brewery put out a Yellow Belly Burger. The piece of bacon was so thick and the sauces on the top and bottom were perfect in flavoring the burger. My only complaint with this one was the bun. It was a ciabatta type bun and every time you took a bite the burger flew out. Don’t get me wrong, it was good enough to reassemble and go again….until it was gone. Those 3 were the best in my mind. 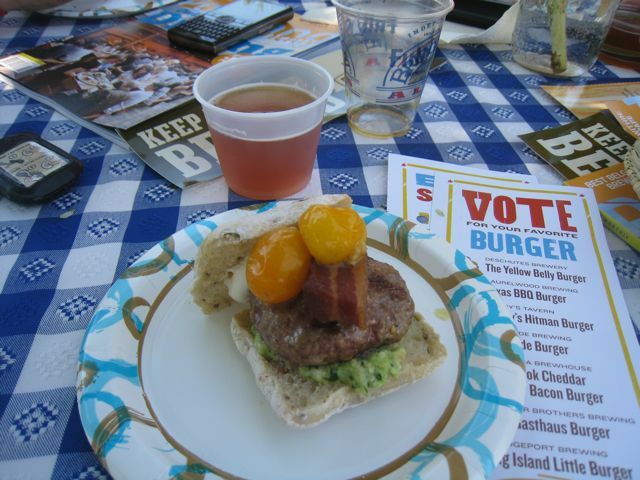 My favorite out of all those was…..the Bridgeport’s Big Island Little burger. Don't judge us. 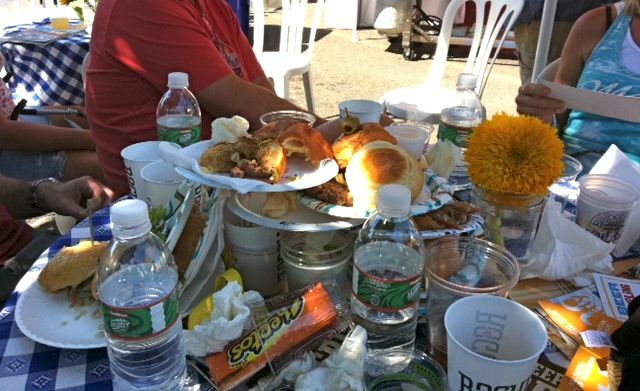 There were 6 of us and this was all of our plates. When you are sampling that many burgers you end up with lots of left overs, because seriously that’s a lot of food and especially bun.There were 6 of us, so don’t think I made this whole mess all by myself. The other fun thing was the free stuff you got. Look at my cool free shirt I got. This was no easy task. It took us over 2 hours to get to all the burger joints, grab beers from each brewery and get any free stuff we could find. Not to mention Fred Meyer had cookies, chips, water and soda. All this was just $17 a person. If you ask me, it’s one great deal. And I was able to EatMyWayThruPortland in just one stop.